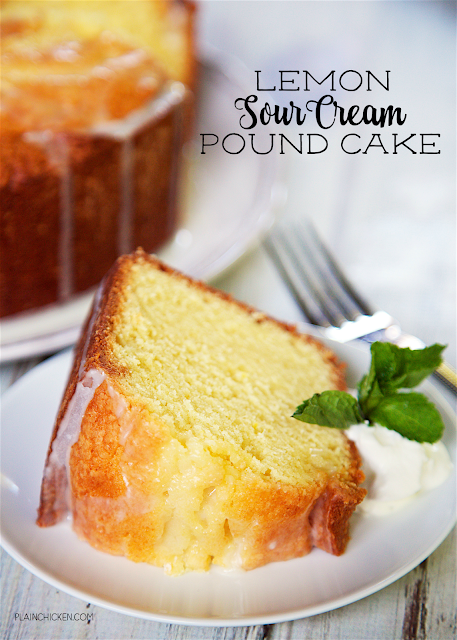 Lemon Sour Cream Pound Cake - the most AMAZING pound cake I've ever eaten! So easy and delicious! Top the cake with a lemon glaze for more yummy lemon flavor. Serve the cake with whipped cream, mint and fresh berries. I took this to a party and everyone asked for the recipe! Stop what you are doing and make this Lemon Sour Cream Pound Cake right now! It is the most AMAZING pound cake we've ever eaten!! It is so light and full of great lemon flavor. I took one bite and knew I was in trouble. SO good! The lemon glaze really puts this over the top. We served this with some whipped cream and vanilla ice cream. This would be a great dessert to take to a potluck. I guarantee there won't be any leftovers! The recipe is hot off the press from Melissa's Southern Cookbook. The book is written and photographed by my friend, Melissa Sperka. There are over 100 recipes for breakfasts, quick-and-easy family dinners, and appetizers for more sophisticated affairs. I've bookmarked tons of recipes to try over the next few months. If they are half as good as this Lemon Sour Cream Pound Cake, we are in for a real treat! Sift together the flour, lemon pudding mix, salt and baking soda. Set aside. Cream together butter, sugar and vanilla. Beat for 2 to 3 minutes, or until light and pale yellow in color. Add the eggs, one at a time, beating well after each addition, stopping and scraping the sides of the bowl as needed. Reduce the speed of the mixer and add the sifted dry ingredients alternately with the sour cream. Mix until fully combined. Stir in the fresh lemon zest by hand. Pour into prepared pan and place in the oven. To make the glaze: In a medium-size mixing bowl, mix together the powdered sugar, lemon juice and butter. Drizzle over cooled cake. This looks so delicious and I can't wait to try it! Love the flavor of lemon in the summer, it is so refreshing! 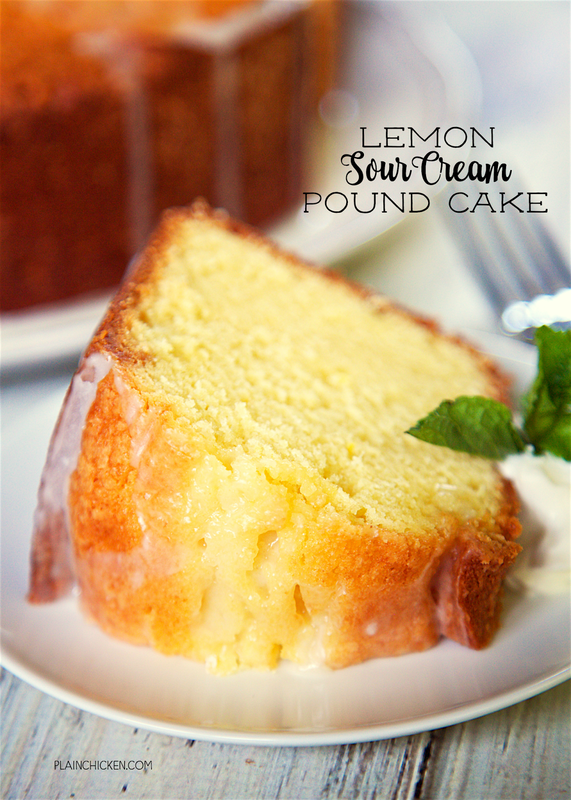 When life gives you lemons, make lemon sour cream pound cake! I made this yesterday. It was good but not very lemony. I would suggest 2 pudding mixes or maybe lemon extract instead of the vanilla. It's a good cake though. Made this cake last night! It is wonderful! Great lemon flavor but not overpowering! I don't have a 10inch tube pan will a bundt pan hold the batter? Just make sure to leave about an inch of the bundt pan unfilled so the cake has room to rise. You might have leftover batter. 325 degrees mean F or C? Use the pudding mix dry. Don't make pudding with it. is there a substitute for the lemon instant pudding mix? I made this and it turned out excellent. Very moist and delicious. Love,love,love this cake. I'VE HAD FRIEND ORDER IT FOR BIRTHDAYS!!! I love the tart of the drizzling thin icing !!! Just enough. I will make this over and over again !!! Made this for my grown son's birthday. He had friends over at his place, and everyone loved the cake. I was even asked to make cakes for some of them for their upcoming birthdays. Delicious! I tried this recipe for the 1st time this past weekend and it was a hit!!! I ended up having to make another the next day because the 1st one was gone. Recipe great as is!!! Anyone tried adding poppy seeds to this lemon cake? Should the eggs and sour cream be room temperature as well? It is always best to have the eggs and sour cream at room temperature as well as the butter, but it will turn out just fine if you don't have time to do that. Enjoy! I used this recipe, then mixed about half of a jar of strawberry polaner all fruit with about a tablespoon of whipped cream vodka. Filled the pan 1/3 of the way with cake batter add the jelly then add the rest of the batter, topped it with unsweetened coconut. Then baked.My family loves it. And I definitely plan to make this cake again. Plain and with jelly. Extremely moist and tender. I baked this cake in a 12-cup tube pan with excellent results. (Could also use a Bundt pan.) Also used just 1 teaspoon vanilla extract, plus 1 teaspoon lemon extract. So flavorful, I did not use the glaze on the cake. This cake recipe is surely a keeper! Made this cake for Easter and it turned out great! Thanks so much for sharing. This a fabulous, yummy cake!!!! Baked it twice. Cut the recipe in half and baked in my 12" loaf pans. Moist with such a nice lemony flavor. It's a keeper! This cake was awesome. Didn’t change a thing. sure - use vanilla pudding and omit the lemon. Should be just fine. What size pan are you using? I made it one in a bundt cake pan the batter overflowed. The recipe doesn't specify unsalted butter. I hope salted butter will not make it salty. That's all I have. Can this cake be made ahead of time and put in the freezer for a few days? I usually use Unsalted butter, but salted butter should be just fine. You can freeze the cake for a few days or months. Enjoy! As per other reviewers, I used Lemon extract, as opposed to vanilla for an extra lemon flavor. This was a very wise choice as I find this cake to be mild on the lemon side, so using vanilla would be even less lemony. I also added 1/4 tsp baking powder and only used 2.5 cups of sugar. This cake was just as I imagined, thank you! I also did not use the glaze. This is my go to cake. It is wonderful. The flavor is rich and lemony. Your family will love it.